What if the Hebrew Bible wasn't meant to be read as 'revelation'? What if it's not really about miracles or the afterlife ? but about how to lead our lives in this world? The Philosophy of Hebrew Scripture proposes a new framework for reading the Bible. It shows how biblical authors used narrative and prophetic oratory to advance universal arguments about ethics, political philosophy and metaphysics. It offers bold new studies of biblical narratives and prophetic poetry, transforming forever our understanding of what the stories of Abel, Abraham, Jacob, Joseph, Moses and David and the speeches of Isaiah and Jeremiah, were meant to teach. The Philosophy of Hebrew Scripture assumes no belief in God or other religious commitment. It assumes no previous background in Bible. It is free of disciplinary jargon. Open the door to a book you never knew existed. You'll never read the Bible the same way again. 1. Introduction: beyond reason and revelation, Part I: Reading Hebrew Scripture: 2. The structure of the Hebrew Bible, 3. What is the purpose of the Hebrew Bible?, 4. How does the Bible make arguments of a general nature?, Part II: The Philosophy of Hebrew Scripture: Five Studies: 5. The ethics of a shepherd, 6. The history of Israel, Genesis-Kings: a political philosophy, 7. Jeremiah and the problem of knowing, 8. Truth and being in Hebrew scripture, 9. Jerusalem and Carthage, Part III: Conclusion: 10. God's speech after reason and revelation. Yoram Hazony is Provost of the Shalem Center in Jerusalem and a Senior Fellow in the Department of Philosophy, Political Theory and Religion (PPR). 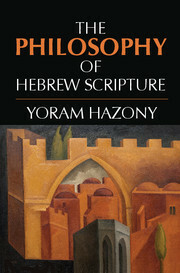 Hazony's previous books include The Jewish State: The Struggle for Israel's Soul and The Dawn: Political Teachings of the Book of Esther. His essays and articles have appeared in The New York Times, The New Republic, Commentary, Azure and Ha'aretz, among other publications. He is author of a regular blog on philosophy, Judaism, Israel and higher education called Jerusalem Letters. Hazony received a BA from Princeton University in East Asian Studies and a PhD from Rutgers University in Political Theory.